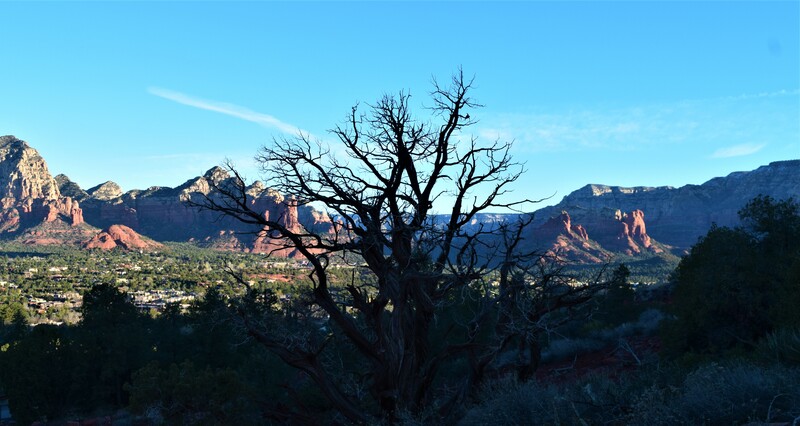 In keeping with our plan to avoid long marathon drives we spent 5 days in Sedona, just 3 hours north of our last stay in Queen Creek. An easy afternoon drive through the desert after a quick lunch at In-N-Out as it would be our last opportunity for a long time. 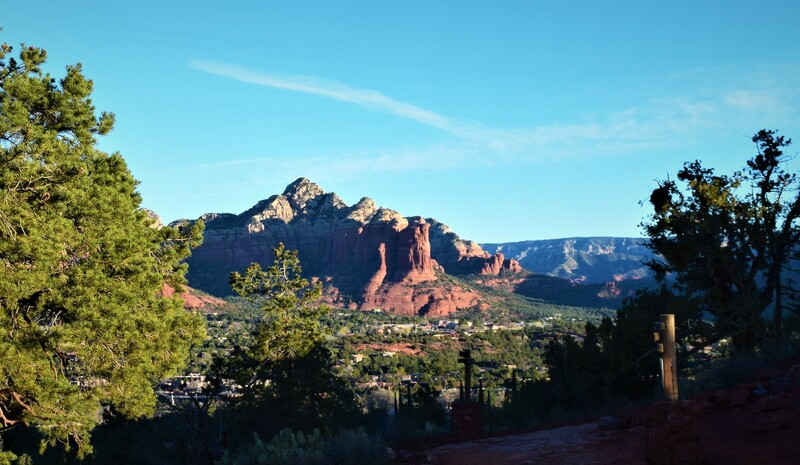 We had visited Sedona over 20 years ago with a quick drive through and knew we wanted to visit again. Funny how 20 years passes before you follow up on a plan to re-visit somewhere. We were not disappointed. 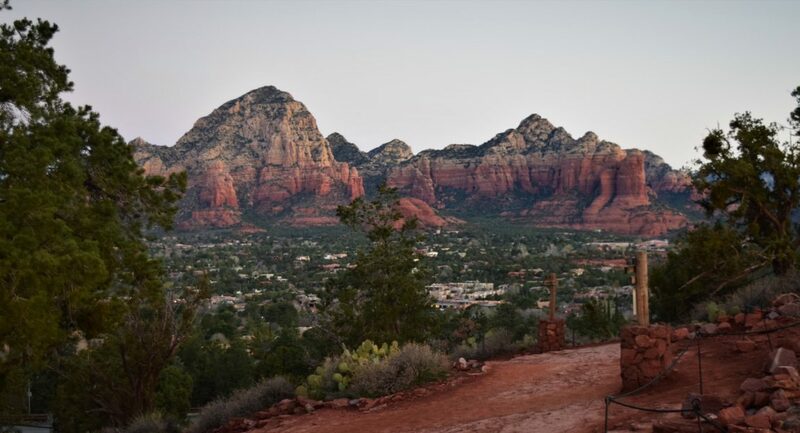 Sedona is stunningly beautiful. The red rock formations throughout the valley are breathtaking. The weather finally cooperated and we had bright sunshine every day. There was some wind the first few days and with 5000 feet elevation it was at times cool. We both agreed that while our photos look nice it is impossible to capture the beauty and grandeur of the mountains. Every morning as we drove into town we commented on what an amazing view locals have every day. You must see the it for yourselves. 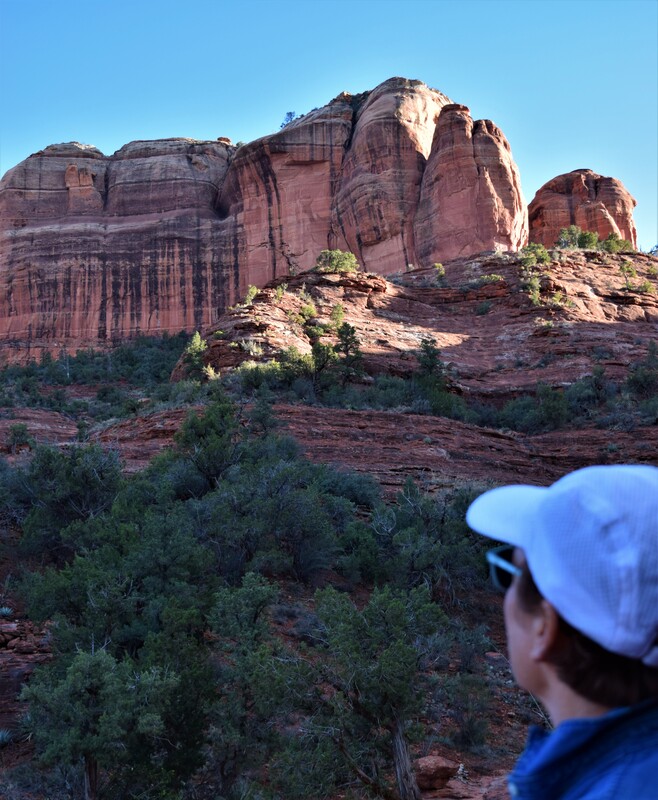 Sedona can easily be enjoyed from a car, but to really get a feel for the area we recommend getting out and doing some hiking. The tourist information center in town is the best place to start. As you enter town from either the south or west you see signs for the “official” tourist information 2 or three miles ahead. 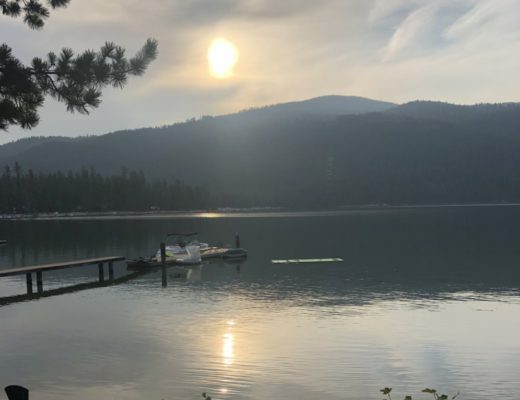 This is because there are several “visitor information” offices as you enter town which are really just offices trying to sign you up for activities or offering you free activities if you are willing to go to a timeshare presentation. Avoid them, take it from a timeshare owner, timeshare presentations are a terrible way to spend your time and are about as enjoyable as a root canal. On our first day we were both awake before sunrise (a habit I still have from 30 years of working), so we decided to head out for sunrise. 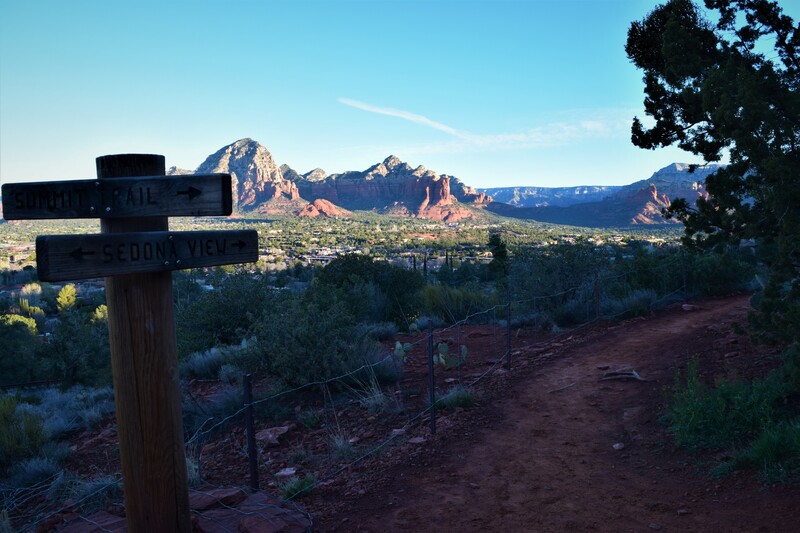 We drove up to Airport Mesa and hiked a short trail to a wonderful lookout over the valley where we watched the sun come up and transform the red rocks as they were painted with light. We returned to our condo for breakfast and showers then headed out for a day driving around the valley. We started with a short loop drive through Red Rocks state park stopping at various lookouts along the way. Next we drove out Dry Creek road to Boynton Pass then back through town and out 89A and Oak Creek Canyon then returning to town for lunch at The Hudson. This sounds ambitious but was easily accomplished in a morning with plenty of stops for pictures and short walks. The entire morning route was less than 50 miles. 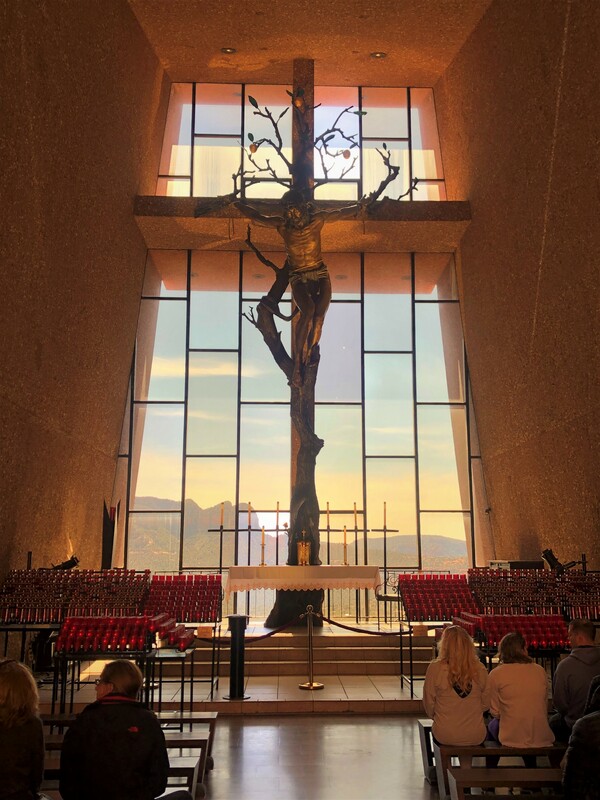 After lunch we drove south on 179 to the Chapel of the Holy Cross, a Catholic Chapel designed by Marguerite Brunswig Staude. Built into the rock and completed in 1956 it is worth a visit. After our visit we were surprised by how visible the church is from around the valley. We then continued south on 179 to the town of Oak Creek where we turned around and headed back into Sedona. 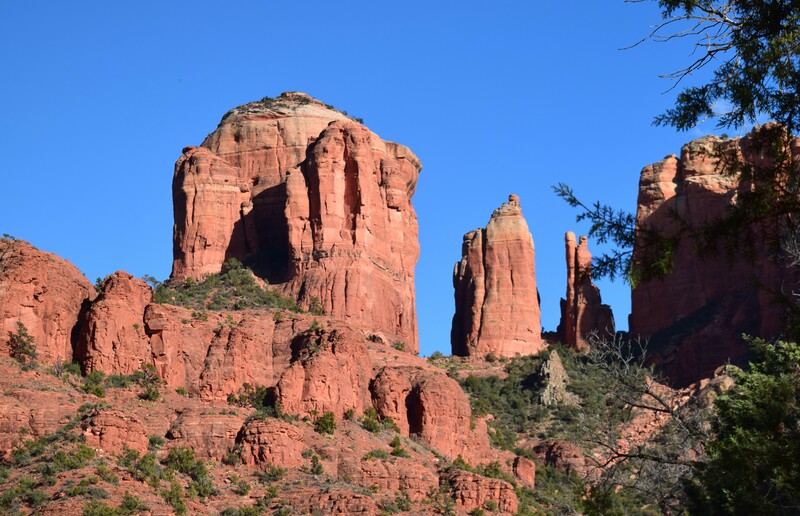 This stretch of 179 is a scenic byway and best enjoyed driving north as you enter the valley and approach Sedona, Bell Rock, Courthouse Rock, Cathedral Rock all line the road as you drive into Sedona. It is awe inspiring. On our second full day, at the suggestion of the nice lady in the official tourist information center, we hiked up Schuerman Mountain for an amazing view of the valley. While hiking up a 5000 foot mountain might sound impressive the trail head starts at 4400 and the entire hike can be accomplished in about an hour and a half. It was a nice afternoon hike with great weather and great views. On day three we actually did a little shopping at the supposedly world Famous Tlaquepaque shopping mall. It is a pretty outdoor mall with nice southwest architecture and mostly locally owned shops and galleries. To be honest, Kelly did some shopping and found a very nice dress while I enjoyed the company of a nice couple from Lake Havasu and the bartender at the Oak Creek Brewery located in the mall. My kind of shopping. Later that day we drove up to the Airport to enjoy sunset with about 200 of our best friends. 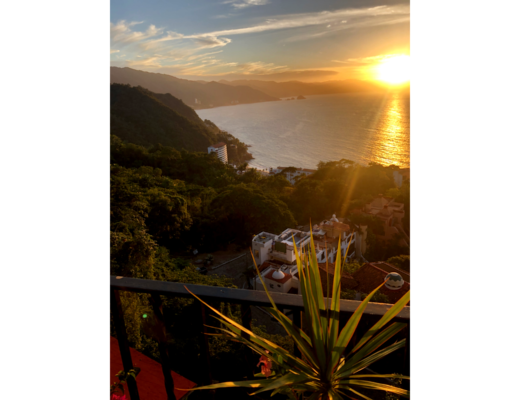 We always enjoy sunset and like the fact that people around the world continue to gather and share this daily ritual. 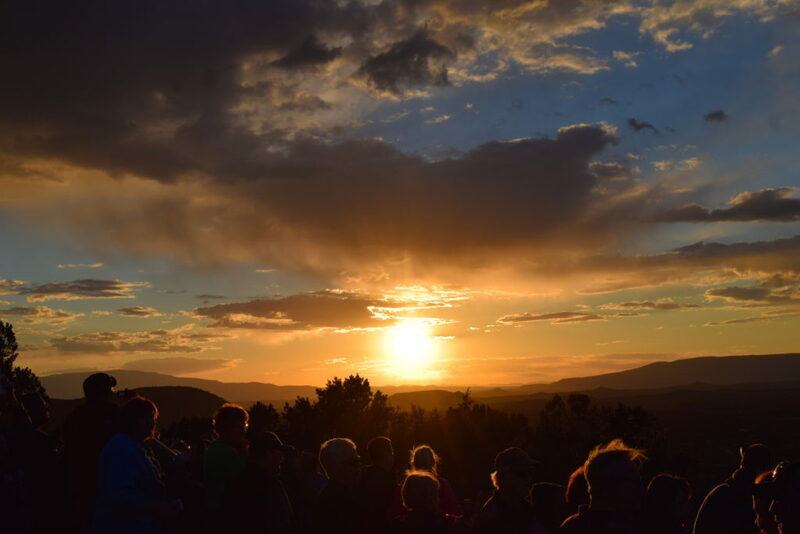 Everywhere we travel we find crowds gathering to enjoy the beauty of the sun sinking below the horizon. The Sedona sunset did not disappoint. The one difference here was the constant shift of your vision from the sunset itself to its display across the Red Rocks surrounding us. 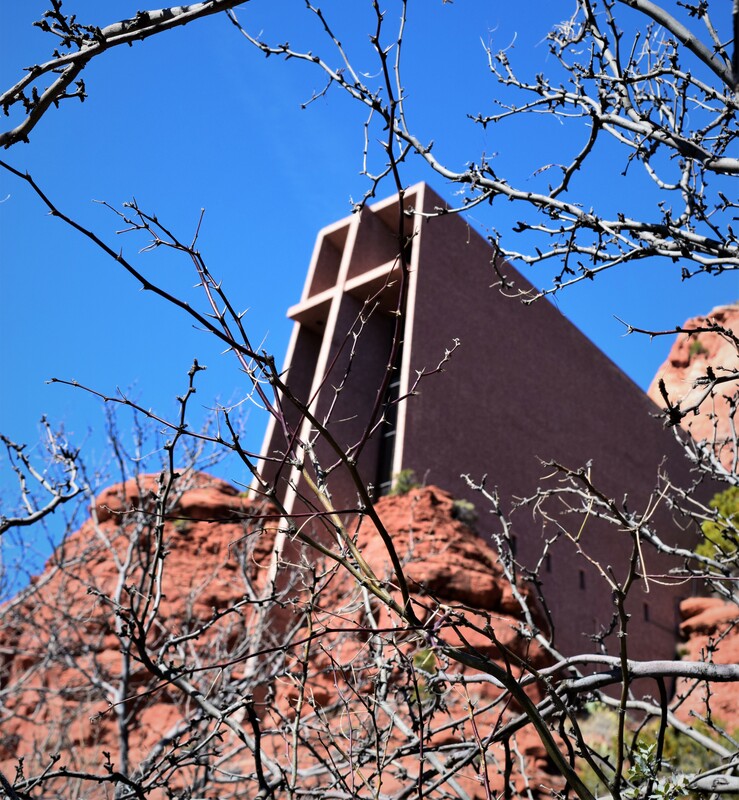 We finished our stay with an afternoon hike around the Baldwin loop trail with a detour out to Cathedral Rock. It was a great hike with constantly changing scenery and great views. 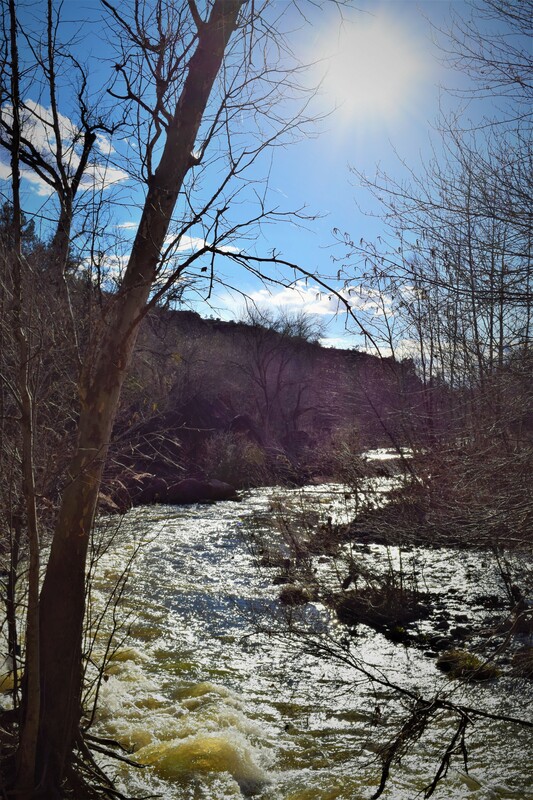 Red rock, cottonwood forest, a raging stream, it had it all. We might have started a little late and taken on a little more than we should as we finished the hike just as the sun was setting and our car was the last in the trail head parking lot. That last half mile was done at a quick pace keeping a close eye on the setting sun and a lookout for the first sign of the parking lot. We took note to plan better for future hikes. 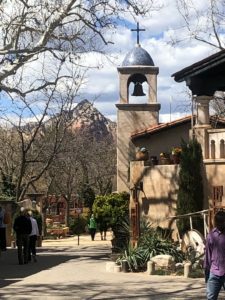 We left Sedona a couple days early not because we had tired of the town but because we wanted to break up the drive to Crested Butte Colorado and because several friends had commented that we simply must see Antelope Canyon and Monument Valley. They were right, confirming that plans should always be flexible. 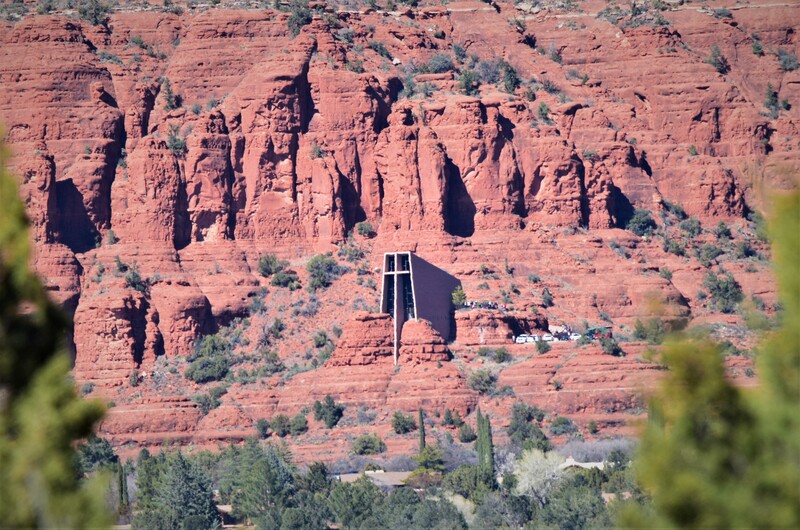 We highly recommend at least a few days in Sedona for anyone traveling through Arizona. I plan to post next week mostly with photos of our stops in Antelope Canyon and Monument Valley. This week we are spending time with our kids skiing in Crested Butte and then making the long drive to Spokane where we will spend some time with Kelly’s parents before heading off to Germany on April 1. As always, if you want to see more pictures click the destination photos tab at the top three pages of full sized photos.